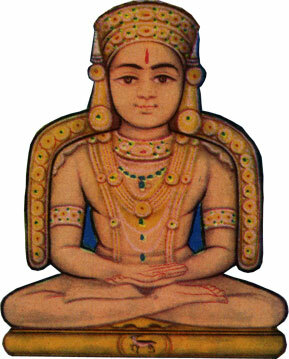 Lord Shantinath was the 16th Tirthankar (Ford-maker) of present era in Jainism. Shantinath was born to King Viswasen Raja and Queen Achira Rani at Hastinapur in the Ikshvaku clan. His birth date is the thirteen day of the Jyest Krishna month of the Indian calendar. Kind Shrishen 2. Birth as a Celestial Being 3. Shriprabhdev 4. Amittej Vidyadhar, 5. A Celestial Being 6. Aparajit Baldev, 7. In the Achyut Celestial World. 8. Vajrayudh Chakravarti, 9. In the Graiveyak dimension 10. Meghrath 11. In the Sarvarthasiddha dimension, 12. Lord Shantinath. According to Jain Cosmology this Universe is divided into three realms. The upper realm is constituted of 12 Celestial Worlds. We live in the middle realm which contains billions of galaxies (dweep). The lower realm is constituted of seven hells. The souls that reside in the upper realm are powerful than us (from absolute perspective all souls are alike but because of virtuous karma many souls take birth in the celestial worlds). The celestial beings can do things which we can’t. Meghrath was a benevolent and religious ruler. He was compassionate and protected all living things. Being a Kshatriya and a warrior he had the chivalry to sacrifice all he had in order to protect those in trouble. One day while observing the partial renunciation vow (Paushadh) he was about to start a discourse on the religion propagated by the Tirthankars. All of a sudden a pigeon, trembling with fear, fell in his lap and uttered in choking human voice, "Save me, O king! Give me refuge; take me under your protection!" The compassionate king comforted the bird and took it under his protection. The pigeon was followed by a falcon who too uttered in human language, "O king! This pigeon is my food, leave it alone." The king tried to explain, "It has taken refuge with me, as such I am duty bound to protect it. I will give you any type of food you want; why kill a living thing just to fill your stomach?" The falcon insisted, "If you will not leave it I may die of hunger. I am a carnivore; who will provide me food. If I die, you will be responsible and bear the sin." When the falcon did not yield, Meghrath said at last, "O falcon! As long as I exist, I will not allow you to die. I will cut out flesh from my body equivalent to the weight of this little pigeon and give it to you. You may satisfy your urge to eat. But under no circumstance I shall allow you to kill the bird that has taken refuge with me." The falcon agreed to this proposal and the king put the pigeon in one pan of balance and in the other started putting pieces of flesh cut out from his own body. Surprisingly, the weight of the pigeon continued to increase as the king went on putting his flesh in the pan. Witnessing this pathetic scene, the queens and the members of the assembly were moved to tears. They requested the king not to sacrifice his precious life for a mere pigeon. The falcon, was also requested relent but he too declined. The king continued to cut flesh from his body and put it in the pan of the balance. At last, when the pieces of flesh were not enough, the king got up from his seat and sat down in the pan. Everyone present was dumb struck at this lofty compassion and chivalry displayed by the king. Suddenly there was a flesh of divine light and a divine personage appeared. The pigeon and the falcon disappeared. The celestial being appeared and addressed the king, "Maharaj! The Indra was praising your compassion and courage, in his assembly. I could not contain myself and came around to test you myself. All this was my creation. You come out with flying colors. You are worthy of the praise bestowed on you by Indra. Please forgive me." The celestial being filled Meghrath’s wounds instantaneously and left for his abode. Whenever there is a talk about chivalry and compassion king Meghrath’s name is taken with respect. Disturbed by the miseries of the mundane life, one day king Meghrath was doing mediation. He transcended to a very high level of purity. Knowing about this uncommon purity and determination of Meghrath, indra bowed to him with reverence, "My salutations to you O citizen Yogi! There are but a few in this world who could reach this level of detachment and purity." Two senior consorts of Indra, Surup and Atirup did not like this gesture of praise of a mere human. They both came to disturb the meditation of Meghrath. They made several beautiful and voluptuous damsels appear before the king. These beauties tried to disturb Meghrath by a display of dances and inviting gestures. When these night long seductive afflictions failed to disturb king Meghrath, the goddesses, before returning to their abode, appeared themselves and asked the king to forgive them. King Meghrath, then, crowned his son and took Diksha from Arhat Dhanrath. Due to his increasing purity in meditation in the face of many afflictions, he earned the Tirthankar-nam-and-gotra-karma. Completing his age he reincarnated in the Sarvarthsiddha dimension. From the Sarvarth Siddha Dimention of the heavenly realm, the being that was Meghrath descended into the womb of queen Achira, wife of king Vishvasen of Ikshvaku clan and ruler of Hastinapur. On the thirteenth day of the dark half of the month of Jyeshta the queen gave birth to the great and illustrious son. The whole universe, including even the hell, was pervaded by a soothing glow and a feeling of joy and happiness. Due to the pacifying influence during the period of pregnancy, the new born was named Shanti Kumar (Shanti = Peace). When he came of age he was married to several beautiful princesses. After a few years king Shantinath got a son who was named Chakrayudh. Several years later, the divine disc weapon appeared in the armory. When the traditional worship rituals of this weapon were concluded, it started moving toward the east on its own. Shantinath followed the Chakra with his armed forces. Most of the kings on the way surrendered. After defeating the remaining few Shantinath became a Chakravarti (A Sovereign King). Slowly and steadily all his Karmas to live in palace and rule as a king was over. He realized the real purpose of his life, his ultimate goal to be achieved in this very life span. He handed over the responsibilities of the kingdom to his son Chakrayudh. For the entire year from that time, he distributed wealth among the people. One day, along with thousand other kings, he came out of the palace, removed his hair with his fist, uttered, “Namo Siddhanam” (I bow down to all liberated souls) and became an ascetic. He went roaming place to place and meditating. Lots of problems came in his path but they all had to surrender to Lord Shantinath’s feet. Due to his pacifying glow of compassion all the animals around him used to come near him and sit peacefully. For one long year, Lord Shantinath did hard practices and remained engrossed in meditation to realize the self. After wandering as an ascetic for one year he returned to the same jungle of Hastinapur Town, where he had taken renunciation. There on the ninth day of the bright half of the month of Paush, while meditating under a Nandi Tree, Lord Shantinath attained Omniscience. His first discourse was on the subject of disciplining the senses. In his first religious discourse his son, mother, wife, all the people of Hastinapur and many people from all around came. Under the influence of the Pravachan Chakrayudh also took diksha (renunciation) and started his journey towards Moksha in the end. He came to the Sammet Shikhar after a long period of preaching and propagating true religion. There, along with nine hundred other Omniscient ascetics, Lord Shantinath started his final meditation to shed the non-destructive karma. On the thirteenth day of the dark half of the month of Jyeshtha Lord Shantinath attained Nirvana.